Regardless if you are in the academe or corporate world, you will need to ask permission to acquire certain things. Some may even require you submit a document to record what you have ask permission to use or acquire. 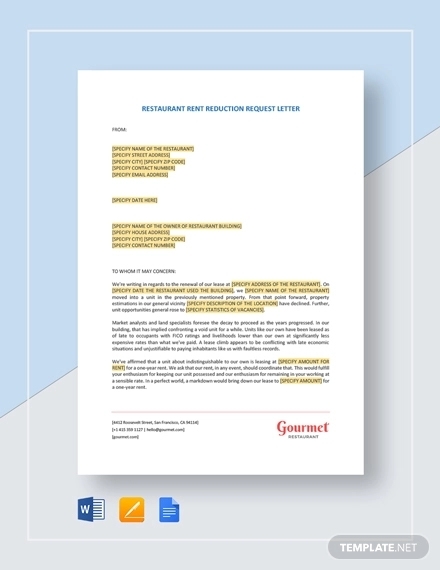 In this case, you need a request letter to explain what you need and why you need it. 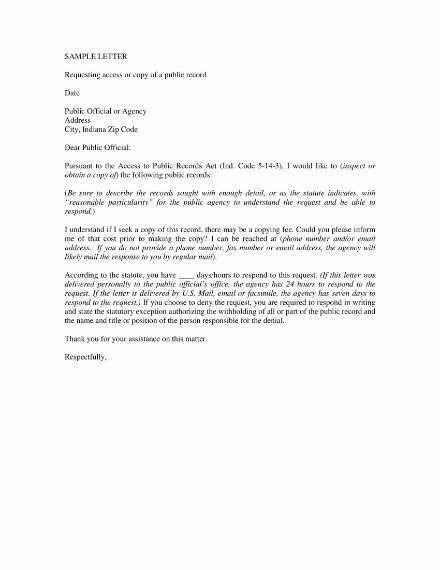 A request letter is written when a person wants approval to a certain demand or appeal. It helps explains why explains all the details about the request to the recipient. 1. Good introduction: Since this is still a letter, you need to make sure you have a great introduction. Your introduction should immediately explain the purpose of the letter, which is to request of something from the recipient. Aside from that, it provides background information about the request. 2. 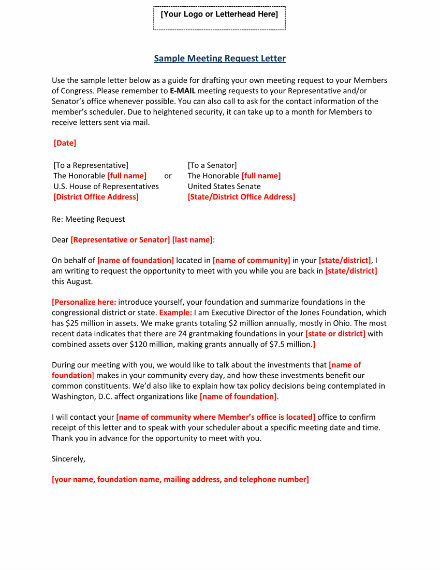 Comprehensive body paragraphs: The following paragraphs of your letter must comprehensively provide supporting information about your request. You must be able to provide specifics about your request like the actual name, quantity, date, and so on. Although it should be short, provide as much pertinent information you can. 3. Courteous tone: Since you are asking permission or seeking approval for your request, it is important to use a courteous tone in your letter. Make sure you don’t sound demanding and bossy in your letter; otherwise, it would be really disrespectful to the recipient. Remember, this is still a formal letter, adhere to its standards. 4. 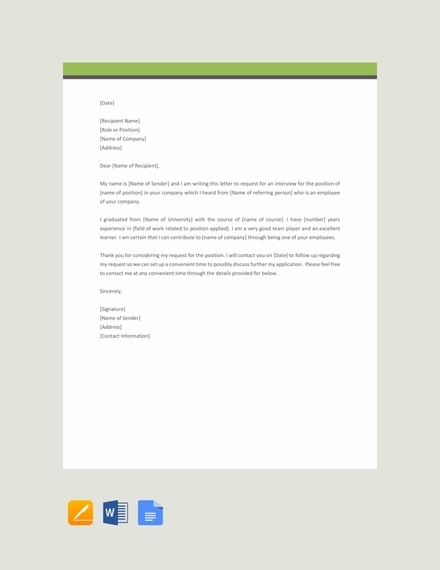 Good formatting: As a formal business letter, make sure you follow the proper formatting. 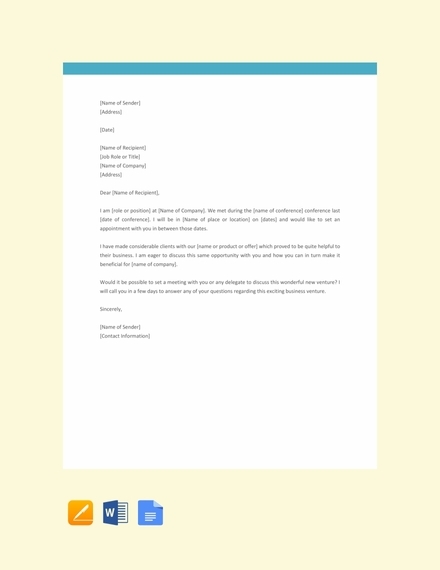 Your request letter must have all the necessary contents and follow the most convenient formal letter format. Your letter must have proper margin on all sides, addresses must be placed where they should be, and so on. 5. 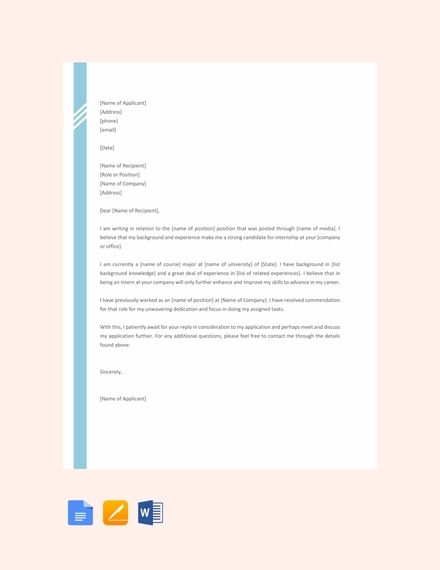 Professional language: As mentioned, a request letter is still a type of a formal business letter; therefore, the language you use should be professional in letter. Avoid using jargon and overly technical words. In addition, make sure you avoid abbreviations unless it is the preferred way to spell things out. The return address of the letter should be on the upper most part of the paper, left or right side depending on the format followed. It should contain the printed name of the sender followed by the complete mailing address and contact information such as email address and/or phone number. It is important to include the date when you have written the letter in order for you to keep track when of the days when the recipient responds. Aside from that, it helps the recipient of the letter take note of the day when the letter arrives on their end, it can help set priorities of the letters they receive, in a way. It is important to write out the complete mailing address of the recipient or receiver of the letter to make sure the letter is given to the right person or company. In this sense, the inside address must contain the name of the receiver, mailing address, and contact information. Regardless of letter format, the inside address is commonly placed on the left side of the paper. The subject line of your letter must briefly convey the topic to be discussed further in the letter. The subject line is usually only a few words long. As indicator, you can include the word Subject before stating the subject of the letter. The terms Re and In re should only be used for legal correspondence. The salutation of your letter must be accurate and courteous. Regardless if the letter is formal or informal, the salutation “Dear” must be used. After the salutation “Dear,” the preferred title and last name of the direct letter recipient must be written. For a formal business letter, the correct punctuation after the salutation is a colon (:). The introduction of your letter must be able to clearly and briefly explain the purpose of the letter. You should immediately write out your intention to request something from the recipient. In the same paragraph, you should specify the date as well as the reason for your request as well. In some cases, supporting details are not really that necessary for request letters. However, in other circumstances the recipient may require it. In this case, write the supporting details on the paragraph following the introduction. The supporting details can be pertinent information regarding how a decision to give a request was made, reason/s why the request is completely necessary, what the requested material or information will be used for, etc. As a conclusion of your request letter, make sure you express gratitude to the recipient for the taking their time to consider your request. In the same paragraph, you can also include or reiterate your contact information should they need to discuss your request further with you. 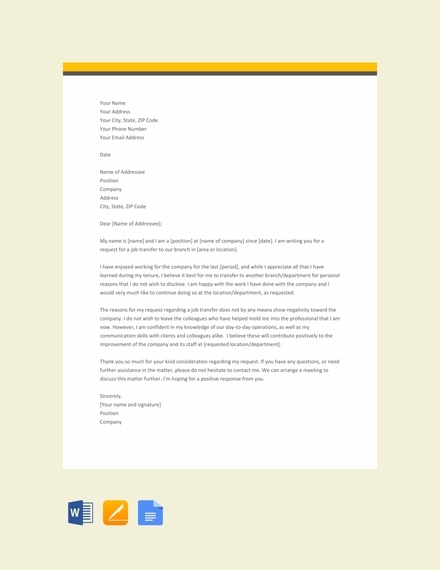 For the same reason why there is a salutation, there should also be a complimentary close for your request letter. It should convey your professionalism and courtesy. A few spaces after the complimentary close, the signature line should come after. It should contain your printed name and title/designation. 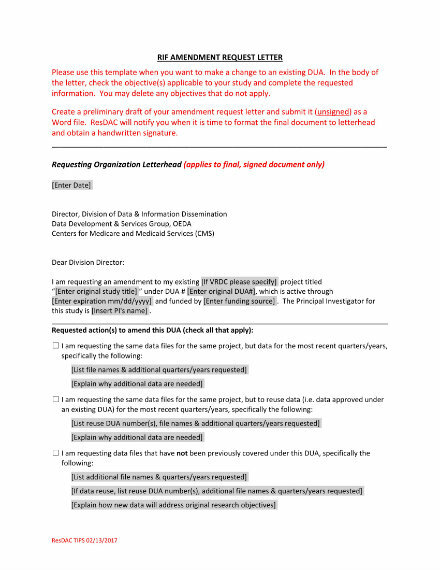 If you have another document attached with your request letter, you should indicate it by using the enclosure notation. And if you have given another copy of the letter to someone, say the office secretary, indicate by putting a copy notation; for example: “CC: name of the person:” after the enclosure notation. Include factual details, but avoid dramatizing the whole situation. Be specific with the details or information you include. Avoid irrelevant details; always stick to the point. Do not manipulate your recipient or reader into approving your request. Aim to be persuasive through the words you use and argument your present. Make sure your request is reasonable. Always be professional and courteous all throughout your letter. Proofread and edit your letter accordingly. Avoid sending letter with error/s. Keep a copy of your request letter in the event that the recipient loses it. 1. 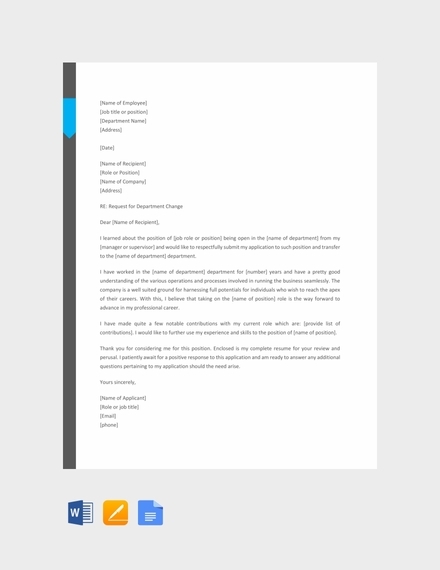 Interview Request Letter: As the name would suggest, this request letter is used to request for an interview most especially for job interview. 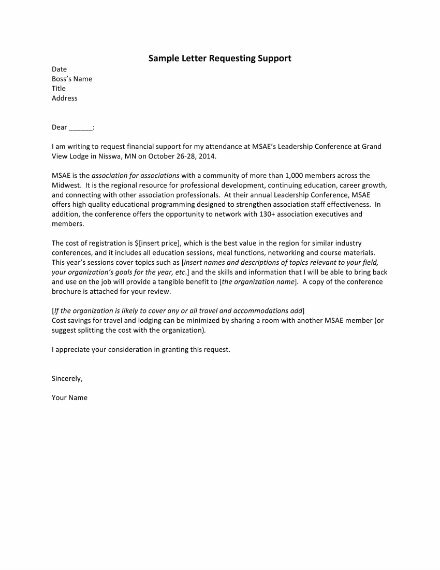 This request letter includes the specific department and position he/she wants to be interviewed for and his/her personal referrals. 2. 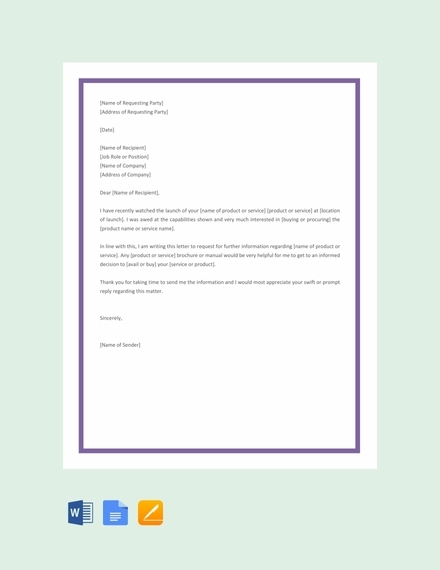 Raise or Promotion Request Letter: This request letter is sent to your employer or supervisor with the intention to request for a salary raise or promotion. The letter should provide the recipient with convincing information as to why he/she is qualified for a raise or promotion. 3. 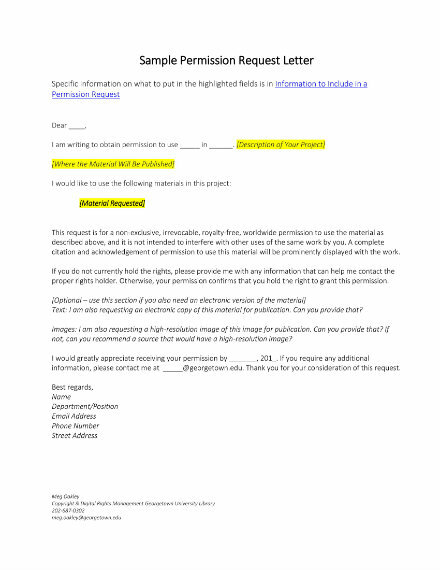 Information Request Letter: An information request letter politely asks the recipient to give the information that is needed by the sender. This letter also explains why there is a need to acquire such information and that he/she is willing to pay the necessary fees in exchange for the requested information. 4. 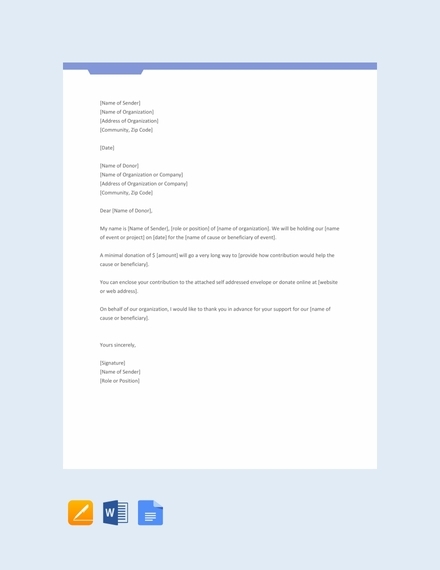 Third-Party Request Letter: This request letter asks a third party for help. For example, when the sender needs a letter of recommendation for a scholarship or work, he/she sends a request letter to his/her references to write a him the recommendation letter he/she needs. The sender should provide all the necessary details in the request letter. 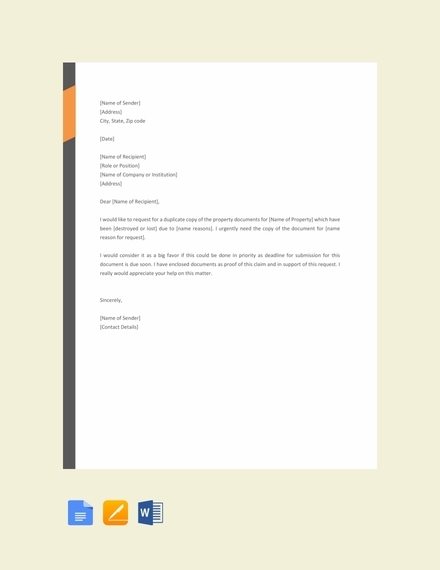 Just like in any formal business letter, the standard paper size to follow is 8.5″ × 11″. Meanwhile, government offices commonly use paper with the size of 8″ × 10.5″. However, it is important to inquire to the office you are sending the letter to about what size of paper they prefer that you use. 1. 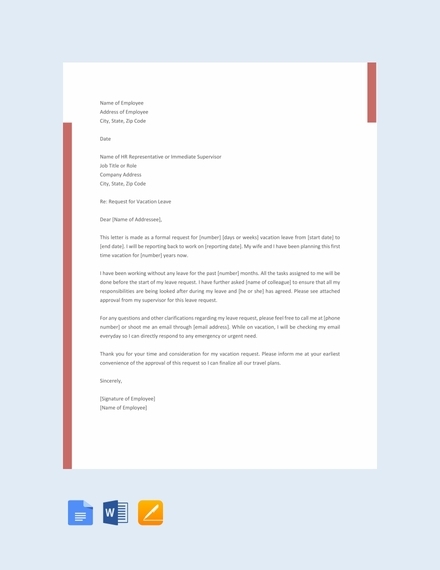 Is a request letter important? In some cases, there might be no need for a request letter especially when offices only require you to fill out a request form. However, there are also instances when an official request letter is needed to even consider what you are requesting. In this sense, a request letter is still important and relevant up to this day. 2. 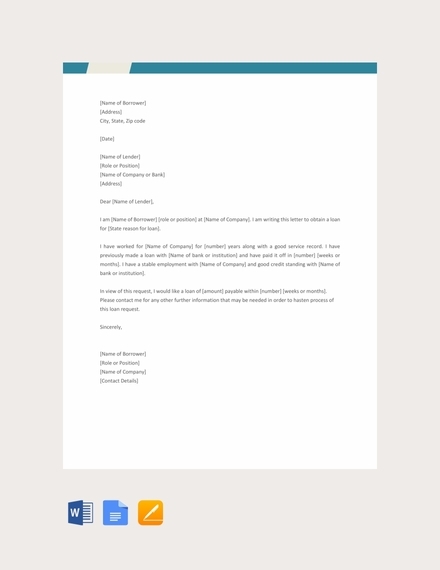 Should there be attachments to a request letter? Depending on what you request for, there might be a need to attach additional supporting documents to your request letter. You can provide your receiver with supporting documents like a summary or analysis of a survey, proposals, plans, and other official documents that will explain the need for what is being requested.